Unfortunately, many users and operators of OR spaces are unaware of the fact that as space temperature decreases, space relative humidity increases. For example, a 68°F space with 60 percent RH, if cooled to 64°F, would then have a space relative humidity of 68 percent (see Figure 1). High humidity levels (above the allowable design range) can be alarming for OR users and operators. It should be known that per ASHRAE Standard 170 the design relative humidity for ORs is applicable only within the design range of space temperatures (see design range outlined in Figure 1). 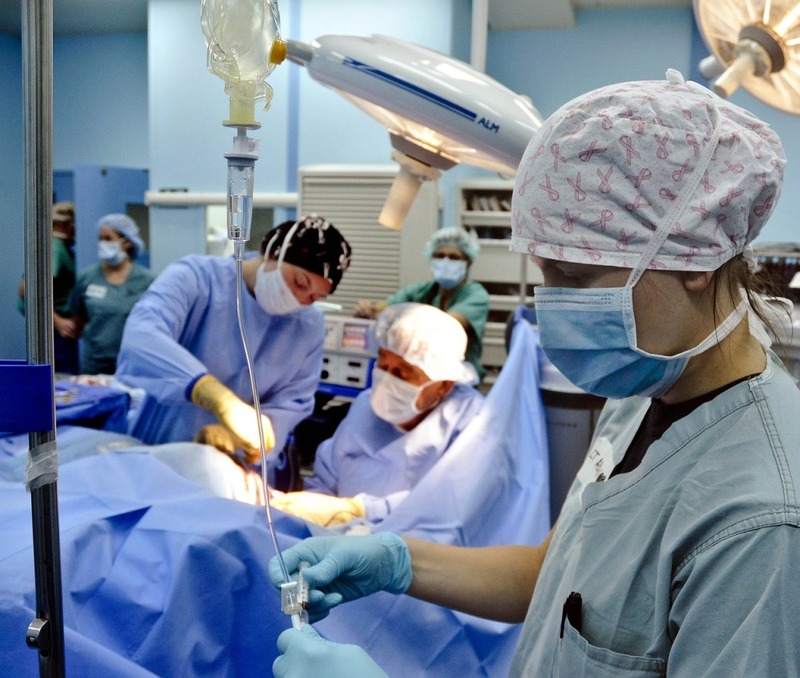 Healthcare facility managers are tasked with providing OR users with the required and desired space conditions. When facility managers face complaints of high relative humidity readings at low temperatures in ORs, there is a need to educate OR users of the range of acceptable space temperature and relative humidity levels in OR. 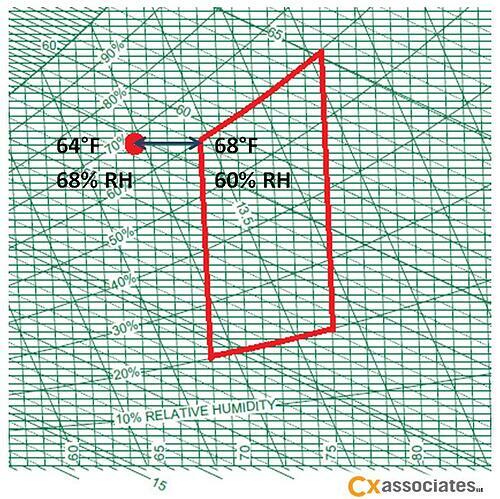 High relative humidity (RH) in conditioned spaces is most likely to occur during the humid seasons of the year, when HVAC systems typically deliver supply air at 55 °F and 95 percent RH. As cool supply air picks-up sensible heat from a space, the relative humidity decreases (space conditions move on the horizontal access, from left to right, in Figure 1). Specify air handler chilled water coils for 45°F supply air temperature. Provide supplemental DX (direct expansion) cooling coils for OR zones. This first option can require significantly higher reheat energy for the air handler system, especially if other, non-OR zones are served by the same air handler system. Furthermore, this option can significantly increase cooling energy by reducing the annual hours of economizer operation (i.e., there are fewer hours in the year with lower outdoor air temperature or lower enthalpy). The second option can help to mitigate the energy impacts on the air handler system, but controllability of DX cooling can be an issue if precise and responsive compressor modulation is absent. Working together, OR designers and healthcare facility managers need to look beyond the prescriptive design requirements of ASHRAE Standard 170, and satisfy the space conditioning demands of OR users with effective and efficient strategies.